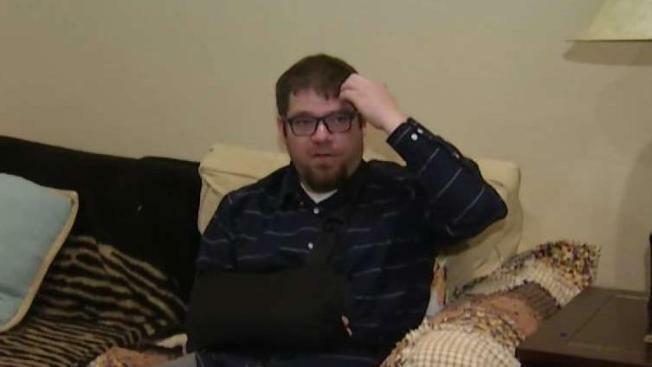 A South Bay resident is looking for the driver of a hit and run accident that left him with compound fracture to his humerus. The victim was walking at the intersection of Santa Teresa and Camino Verde when he was hit. Damian Trujillo reports. A South Bay family is searching for the driver in a hit and run crash that left the victim injured and is offering a reward for anyone who has information. James Eisner was walking towards the bus stop at the intersection of Santa Teresa and Camino Verde when he was hit. "Next thing I know, I am just going on top of this guy’s hood," Eisner said. A witness described the vehicle as a Mercedes-style sedan with European-style plates on the Nextdoor app. "He struck me. I rolled up over his hood, and then I rolled off onto the ground. He just left me there in the lanes of traffic," Eisner said. Eisner took himself to the emergency room only feet away from the scene where he sustained a compound fracture to his humerus bone. James’ father is offering a reward and has increased the amount to anyone with information. "I am offering a $2,500 reward. Originally I posted $1,000, but I am offering $2,500 for whoever can put me in touch with that person," Jim Eisner said. The family has not been able to find any surveillance footage of the crash and officials are asking anyone with information to contact the San Jose Police Department. "It’s pretty ridiculous that someone is going to run you down in the crosswalk and just drive off leaving you laying down in traffic," Eisner said.